The 2004 KBS "Sorry, I Love You" actress is coming back with the tvN drama "Chicago Typewriter" for the first time in 13 years. Im Soo-jung plays the role of Jeon-seol, a fan of star writer Han Se-joo. "Chicago Typewriter" released stills of Im Soo-jung. She's on the phone with someone with a bright look on her face. In the second picture, she's in a beret. Jeon-seol is a great fan of a famous writer and she's not embarrassed to show it. She's cool and boyish. "Chicago Typewriter" is about a mysterious typewriter than connects the years 2017 and 1930. It's based on a bestselling writer named Han Se-joo (Yoo Ah-in), his ghost writer Yoo Jin-oh (Go Kyung-pyo) and a fan that goes from fan to anti-fan. In a previous interview, Im Soo-jung said, "I was so thrilled when I received the script for "Chicago Typewriter"". "Chicago Typewriter" is written by Jin Soo-wan and directed by Kim Cheol-gyoo. 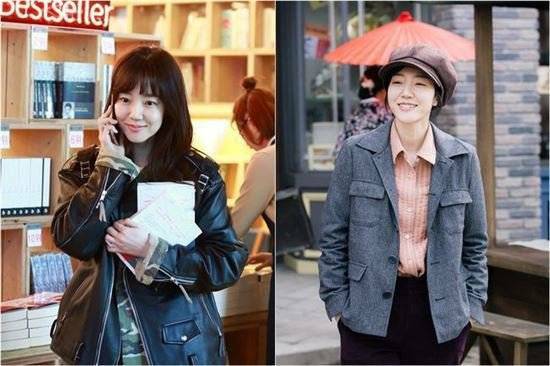 "Im Soo-jung returns for the first time in 13 years with tvN "Chicago Typewriter""